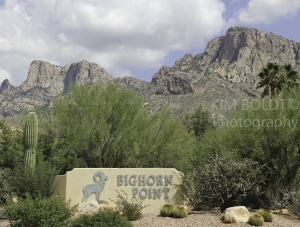 Bighorn Point Subdivision Tucson AZ is located in the Town of Oro Valley. Oro Valley, AZ is about 15 miles north of Tucson. La Reserve sits between the Santa Catalina Mountains, the Coronado National Forest and the Catalina State Park. Bighorn Point Subdivision Tucson AZ provides a gated community with two staffed entrances and one automatic gate. La Reserve is close to shopping, restaurants, and entertainment. The Town of Oro Valley is a vibrant and growing area. La Reserve Tucson homes are built on 1100 acre at the foot of the Catalina Mountains. Bighorn Point is one of 16 neighborhoods within La Reserve and seems worlds away from the city, but is close to everything. Each “neighborhood” within the La Reserve Tucson community provides its own style and character. Map to La Reserve Tucson. Residents in Bighorn Point Subdivision Tucson AZ can choose from a wide range of lifestyles. From Townhouses in Stoney Canyon to multi-million dollar custom homes. Custom homes are found in the three Wilderness Estates neighborhoods. Some neighborhoods offer homeowners facilities including pools, grills, and spas. Golf is also nearby for residents of La Reserve. The Golf Club at Vistoso, Tucson National, and El Conquistador Country Club are open to daily play. Oro Valley Country is a private members only facility within a mile of Bighorn Point Subdivision Tucson AZ. Other golf courses are available about 10 miles to the North at Saddlebrooke and Saddlebrooke Ranch. To the West is Dove Mountain. The Highlands at Dove Mountain is an active adult community with a golf course. Other Tucson subdivisions nearby Bighorn Point include Pusch Ridge Estates to the South, Palisades Point to the North and West of Oracle Road and El Conquistador Resort to the Southwest. Planning a move to Tucson OR Interested in searching Property For Sale In Tucson? We can Help! Thank you for visiting www.premiertucsonhomes.com! Our website provides information on communities and neighborhoods in the greater Tucson area. We are ready to answer your questions and help you get the information you are looking for. It’s one of the top real estate websites in Tucson. Our clients say that, not us.